On the spot surf school is a family friendly surf school. 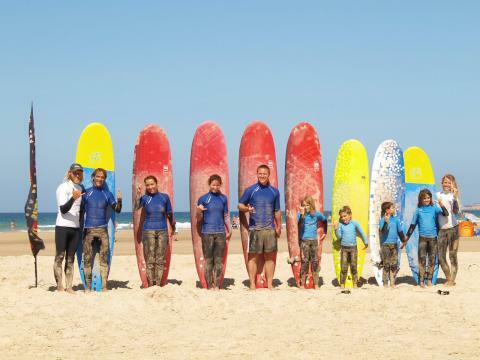 We specialize in families and aim to make kids and parents to have a great time surfing together. Our school has equipement (surfboards and wetsuits) of all sizes so kids big and small will have the right size of board and suit. We speak 5 languages (Spanish, English, Dutch, French and German) this allows us to communicate with kids in their mother tongue ensuring safety and quick learning. The ' OnTheSpot Surf School is located in Conil de la Frontera and El palmar (Vejer) on the Costa de la Luz (Cadiz) in the south of Spain. OnTheSpot offers professional surf lessons to beginner and advanced surfers in Dutch, French, English, Spanish and German. We also rent out surfing equipment (surfboards, wetsuits and Lycra) and give advice on the different types of surfboards, wetsuits, Swellvoorspellingen, best surf spots in the area, etc. The surf lessons go on the beach El palmar in Vejer de la Frontera and the beaches of Conil de la Frontera such as La Playa de los Bateles, Playa de Fontanilla and Playa de Fuente del Gallo. © Copyright 2019 dominiquedc. All rights reserved. Sitemap Disclaimer Drupal website powered by Dropsolid.